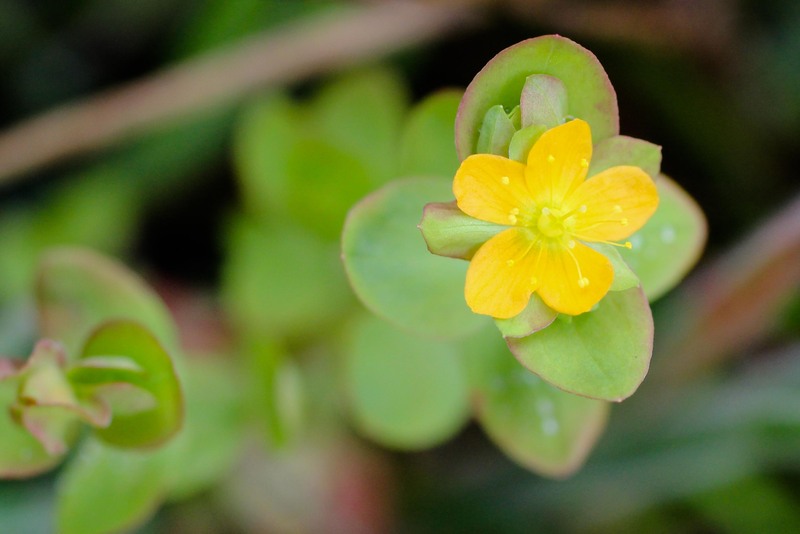 I was surprised to learn that this tiny, unassuming flower is a Hypericum–which is typically a showy and large-flowered genus. And though it has a lot of stamens (15-25 per flower) compared to most flowers, they still are comparatively sparse–some species have up to 120. Tinker’s penny (Hypericum anagalloides, or creeping St. John’s Wort) is common in wet meadows and marshes. I generally have spotted it in the gaps between clumps of rushes. Superficially this plant reminds me of the non-native scarlet pimpernel, and the two names are similar: Anagallis arvensis and Hypericum anagalloides. I don’t know much (ok, any) Latin but I wonder if anyone out there has an idea as to why? Good observation; “oides” means “like,” so anagalloides means a plant like the something in the genus Anagallis.